I’m wearing an unfinished skirt. 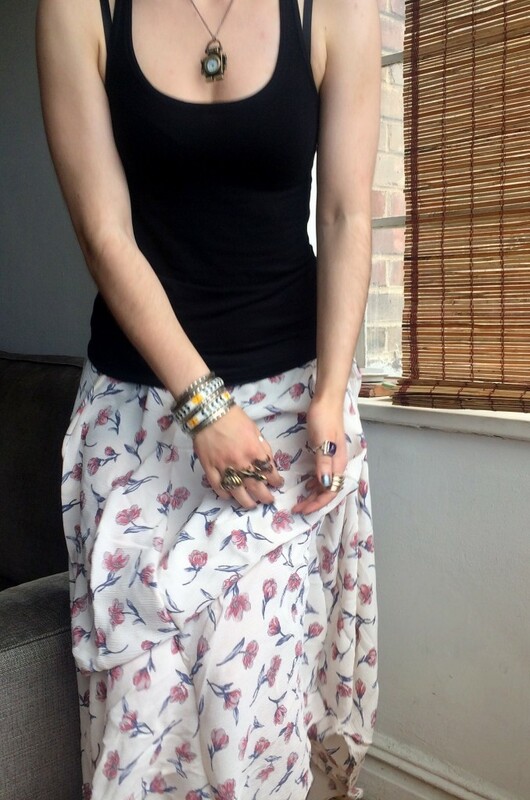 Basic black tank, an unfinished skirt, and a whole bunch of jewelry. I’m kind of sick of all my clothes at the moment, (all five of them), so I spent most of yesterday sewing, and couldn’t come up with anything I liked. One of the problems I’m running into is something I pointed out in the first fabric post, which is that I gravitate towards light colored fabrics, but prefer wearing dark colored clothing. Plus, I prefer wearing separates, but have been concentrating on sewing dresses. I don’t know. But I should probably remember to buy dark fabric, and concentrate on making separates. 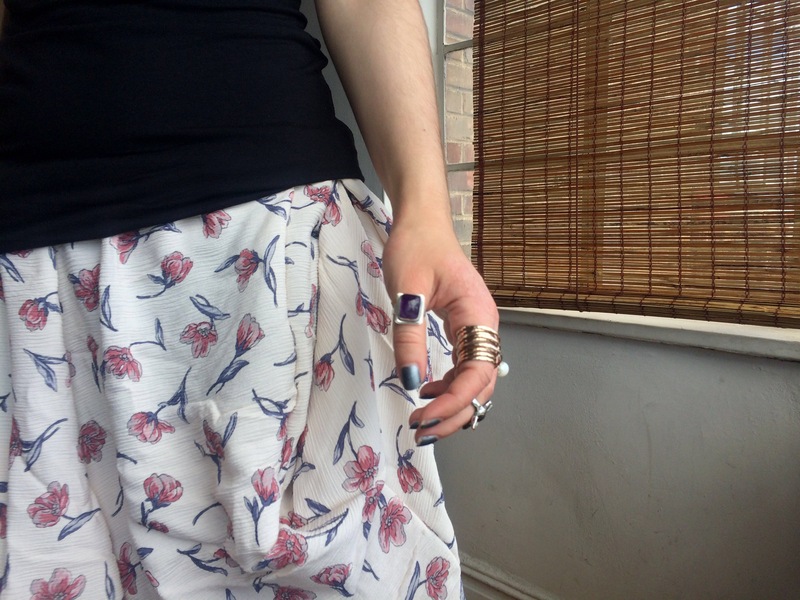 That being said, I whipped up this skirt this morning and love it! It’s not done but I’m wearing it anyway. 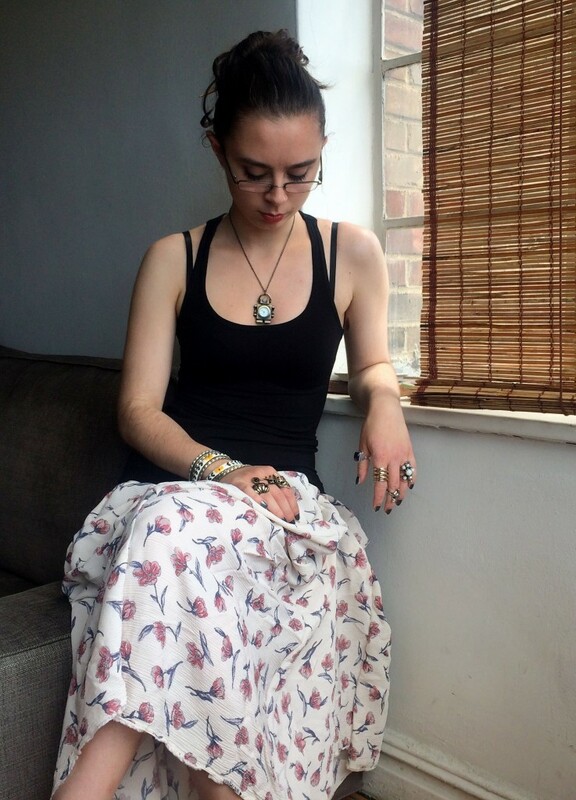 It’s a basic 6 panel maxi skirt that I gathered at one hip. I know this photo is a little blurry, but you can see the draping a little better. The skirt is wrinkly, un-hemmed, and I want to add a second layer of the same fabric to it, plus the gathering is currently being held in place by a safety pin. But I love it. So there. A better look at the print, and some of the rings. PS. Chapter one of the book is now available!!! Wheeeeeeee!